My Card is a digi stamp from Spesch Stamps via Mad 4 Markers Store. A cute forest elf which my colouring did not do any justice to. This little elf is GORGEOUS and was really easy to colour and add to, but I did find the point that uh oh.. was too much. Anyway I hope you like it. I used copic blues B23 and B63 for her dress, the olive green leaves were YG95. I quilled the edging in yellow paper, a couple of gold accents and beading. There will be prizes for people who hop along .. hidden on blogs throughout the hop so make sure you leave a comment on every blog! oooh.. beautiful card Billie! one of my very favourite Spesch stamps images! LOVE the colourful flowers!! Love the added touch from the quilling too! Thanks so much for joining in our Mad for Markers Birthday celebrations!!! I love your card, especially the quilling around the edge - so effective. Such a fabulous card, lovely image too. Thanks for joining in the M4M fun Billie and sharing your sweet card - the quilling is a gorgeous finishing touch. Great card, love the stamp and the quilling!! She is very Sweet ! Love the quilling too ! Your card is so sweet..love the detail you added. This is a gorgeous card. You coloured her beautifully. 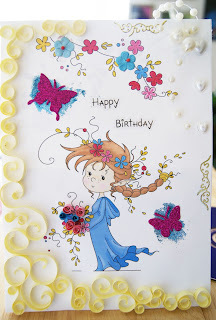 love the use of quilling and stamping an inpressive card. Congratulations on your win! Well deserved.